Just as excessive humidity can cause health problems and discomfort, so can excessive dryness. When the air in your home is below 30 percent humidity, it can cause nosebleeds, infections and may increase asthma symptoms. In the dry air of the winter season, and especially in homes that have forced hot air heating systems, an air humidifier is highly recommended. While drinking fluids and using skin moisturizers will help to a degree, an air humidifier will fix the problem all winter long. A humidifier increases the air's moisture and will relieve dryness in the nose and throat. This can be a tremendous help to people who have allergies or are susceptible to colds and flu. Dry air is also unhealthy for your furniture, wood flooring and paint, causing wood to crack and split. We carry whole house and single room humidifiers. Our Honeywell whole house humidifiers connect to your furnace and work in tandem with your heating and cooling system, distributing moisture to all parts of your home. See our Whole House Humidifiers Information page for more information. We also carry replacement humidifier pads for the Honeywell whole house models. Room humidifiers have a container that is filled with water, and this water is sent through a filter and then distributed through the room as a warm mist. Our Sunbeam Warm Mist Humidifier has a digital humidistat that regulates how much mist circulates, depending upon the setting. 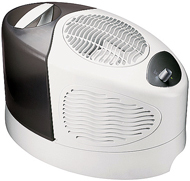 These types of humidifiers are meant for smaller rooms.